"Plaque to commemorate the Waimate Nurses who died during the sinking of the Marquette, 23 October 1915." 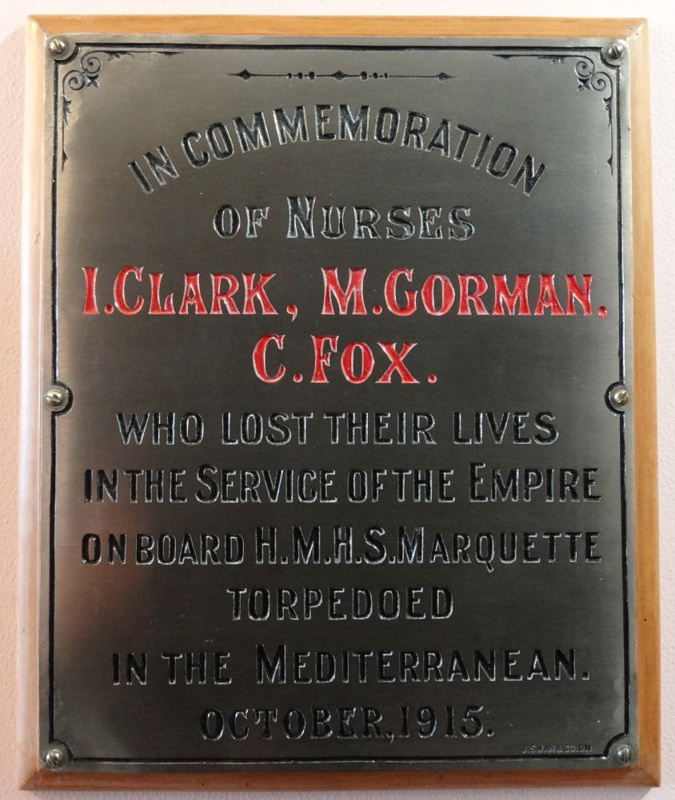 In commemoration of Nurses I. Clark, M.Gorman, C.Fox. who lost their lives in the service of the Empire on Board H.M.H.S. Marquette torpedoed in the Mediterranean. October, 1915. This plaque used to be displayed on the walls of the Waimate Hospital until it closed in 1996. The women’s ward at the Waimate Hospital was named the Marquette Ward after the nurses that drowned in WWI. The plaque is now on permanent display at the Waimate Museum. It is identified as a Category C in the Heritage Protection items of the District Plan.